A few days ago, Parse announced they are shutting down the servers next year. There has been panic among developers, looking for exit strategies and alternatives. Those who were using Parse for its storage features are now probably looking at Firebase or Couchbase for a Parse alternative. Those who were using Parse for its Push Notification API are probably falling back to pure FCM/APNS solutions. 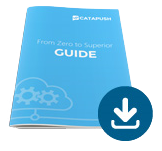 Check out our integration guides for Android and iOS and start sending superior push notifications in minutes with Catapush. Build intelligent messaging logic in your real time applications.